Hogwarts at Universal Orlando's Wizarding World of Harry Potter. On Thanksgiving eve, my family and I piled into our trusty Toyota Camry with hopes of making a six hour drive to Orlando, Florida. After a hotel-reservation-making spree during the summer, the trip was finalized: two days at theme parks Universal Orlando and Disney World, respectively. I had already been to Disney World once before during an eighth grade orchestra trip, but Universal Orlando was something that was completely new to me. Needless to say, as someone with a history of being enamored with popular YA fantasy series, I was mostly looking forward to experiencing the Wizarding World of Harry Potter at the park. The Wizarding World of Harry Potter at Universal Orlando is actually divided between two parks: Diagon Alley, an outdoor shopping center for wizards, is located at Universal Studios, while Hogsmeade, a wizarding village that the Hogwarts students frequented in the books, is at Universal’s Islands of Adventure. I would recommend purchasing a park-to-park ticket in order to board the Hogwarts Express and travel between the two. I entered the park through Hogsmeade, but I would actually recommend doing the opposite and starting with Diagon Alley. Not only is Diagon Alley the setting of Harry’s transition from a quiet, mistreated boy in London to a fully-fledged wizard at Hogwarts, it is also picturesquely tucked away behind a series of brick walls at Universal Orlando, masked by a London-themed street from the outside. Entering Diagon Alley, I was taken aback by the beautiful, intricate architecture of the shops. The cramped and somewhat crooked Victorian-style buildings really do add to the mystical ambiance of the novels. At Diagon, I started off with a helping of butterbeer-flavored soft serve ice cream from one of the local confectionaries. I then moved on to visit the shops for robes, quidditch supplies, other wizard-themed food, and of course, my personal favorite, wands. The Wand Ceremony at Ollivander’s is very well executed. Out of a group of around fifteen people that attend at a time, one person is chosen to receive a wand. I ended up being chosen during my first time, mainly because the wand masters like to pick younger people that look like they know nothing about Harry Potter (I was wearing a Georgia Tech hoodie at the time). The wand master is always portrayed as an eccentric, elderly wizard, and during the ceremony, they pick out several wands that might be suited to you. Special effects are used to portray the wand’s capabilities. I don’t want to give too much away about the ceremony, but it is a very special experience. 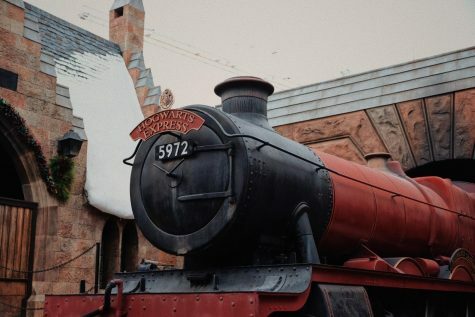 Like most theme parks, you can have a good time at Harry Potter World with just an admissions ticket, but you do have to pay extra to have a better time. In order to feel truly immersed in J.K. Rowling’s story, many guests buy robes and other souvenirs. The hazel unicorn hair wand I was granted wasn’t just given to me for free; it was $40. I did not end up purchasing the wand, but do keep in mind that those that do can use their wands to perform hidden “spells” throughout the rest of the park. 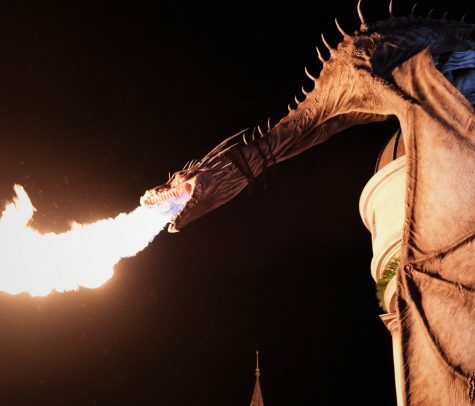 The dragon on top of Gringotts Bank breathes fire. The Gringotts Bank is also located at Diagon Alley, where an animatronic dragon that periodically breathes fire is sprawled on the building’s pearly white dome. During your visit, take care to not miss the fiery spectacle. I was able to snap a quick photo with my camera at 6:10 pm, but you can always know about the event ahead of time by asking one of the workers when the next dragon’s breath is. Prior to the flame, a low hissing sound will also be emitted throughout the park. The first out of three Harry Potter-themed rides is also located at the Gringotts Bank. A roller coaster dark ride hybrid, Escape from Gringotts is advertised as a “high thrill ride.” As an absolute chicken when it comes to roller coasters, I still thought this label was an exaggeration. There is maybe one roller coaster-style drop in the beginning, but other than that, the ride is slow and gentle for the rest of the five minute duration. Needless to say, the ride has some impressive special effects, and the goblins in the waiting area are a neat addition to the park. I would not recommend missing it during your visit. But in terms of rides, I would say that Hogsmeade has Diagon Alley beat. 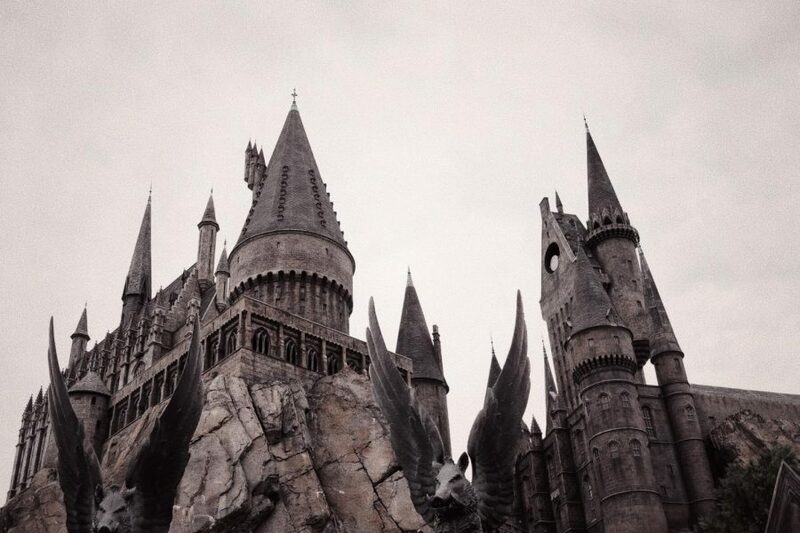 While Escape from Gringotts is great, Hogsmeade is home to Flight of the Hippogriff and Forbidden Journey. But before experiencing these rides, two very important things await: the train ride to Hogsmeade and lunch. The Hogwarts Express is the sole form of transportation between Hogsmeade and Diagon Alley. Before boarding the train, you need to leave Diagon Alley behind and enter the Muggle-London area of the park. Beyond the red telephone booths and fish and chips stands, there’s a faux subway station. The wait for the Hogwarts Express is unfortunately rather lengthy, but the ride itself is also an immersive, interactive experience. Like Harry, all passengers run through a brick wall projection in order to board train. There are two ride experiences on the Hogwarts Express, one for leaving Hogsmeade and one for entering it, but I personally prefer the latter. A video is projected onto the window to give the illusion of the Hogwarts countryside, and the talking silhouettes of Harry, Ron, and Hermione can be seen through the sheer compartment doors. Just make sure to watch out for Dementors! At Harry Potter World, there are two main spots for lunch, one located at each park. The Leaky Cauldron at Diagon Alley and The Three Broomsticks at Hogsmeade both serve traditional British pub food including fish and chips and shepherd’s pie, as well as turkey legs, Guinness stew, toffee pudding, and butterbeer. Unfortunately, I can’t say too many great things about the food; it is essentially fast food sold at the price of a full meal, but it doesn’t necessarily taste bad. In contrast, the cream soda-flavored butterbeer, topped with a thick layer of butterscotch cream is delicious. You can order it frozen, regular, or hot. I would say both the hot and frozen trump the regular in terms of texture and flavor, but all versions of the iconic drink taste incredible. After dining in Hogsmeade, our group waited in line for the short, yet charming Flight of the Hippogriff roller coaster. Lasting only one minute, it is comparable to a much shorter Space Mountain, with the exception of being an outdoor rather than an indoor coaster. Despite its duration, the ride is fun, but it is skippable. Located in the actual Hogwarts castle itself, Forbidden Journey is a simulation-style dark ride that follows the perspective of a wizard-in-training at Hogwarts. Using a mix of animatronics and top-tier projection technology, the ride can be a little aggressive at times, and those prone to motion sickness should veer away from boarding, but I firmly believe that it is one of the best rides in all of Universal Orlando. Like Soarin’ at Disney’s Epcot, each car is mounted on a robotic arm that shifts and tilts to match the imagery. Unlike Soarin’, the movement of Forbidden Journey is rather intense. Nonetheless, I would not recommend skipping out on it, even if the waiting time is long. The line for Forbidden Journey is somewhat of an interactive journey itself, where you can listen to paintings in the Hogwarts halls argue back and forth and even catch a glimpse of Harry, Ron, and Hermione as they skip class. It is a stunning experience. In conclusion, the Wizarding World of Harry Potter at Universal Orlando is a lovely homage to the original series. From Moaning Myrtle haunting your stall during a bathroom break to Dementors hijacking your train car, it is truly an immersive experience. As someone that grew up with Harry Potter, my visit was nostalgic and brought me back to my childhood. If you’re a fan like me, keep your eyes peeled for hidden references, tricks, and spells scattered sporadically through both parks during your visit. If you’re new to the series, get ready for a spectacular introduction to the Harry Potter Universe, and prepare yourself for a possible binge-reading session after. 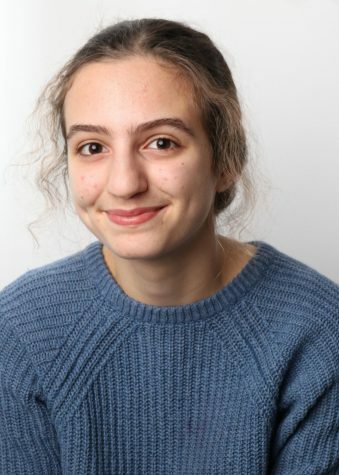 I love Harry Potter, this article, and Iris Tsouris writing articles (in no specific order).